Understanding that the Eucharist is the "source and summit" of our entire being, the Yuma Catholic community regularly gathers around the Table of the Lord. Recognizing that each person has his or her vital place within the Body of Christ, each student is encouraged to actively participate in all liturgical celebrations. Opportunities to participate include serving as musicians, altar servers, lectors, gift bearers and Extraordinary Ministers of Holy Communion. In addition to the regular celebration of the Eucharist, the community of Yuma Catholic gathers daily for various forms of prayer. These prayer services can be tailored to highlight the particular liturgical seasons or address the various needs of the student body. In planning and implementing these celebrations, our Campus Ministry Team and Theology Department has the opportunity to creatively reflect the dynamic faith life of our student body. Periodically taking time out to reconnect with God and each other is essential for spiritual growth. Yuma Catholic High School demonstrates the importance of this practice by arranging retreats for each grade level. Yuma Food Bowl to support the Yuma Food Bank! 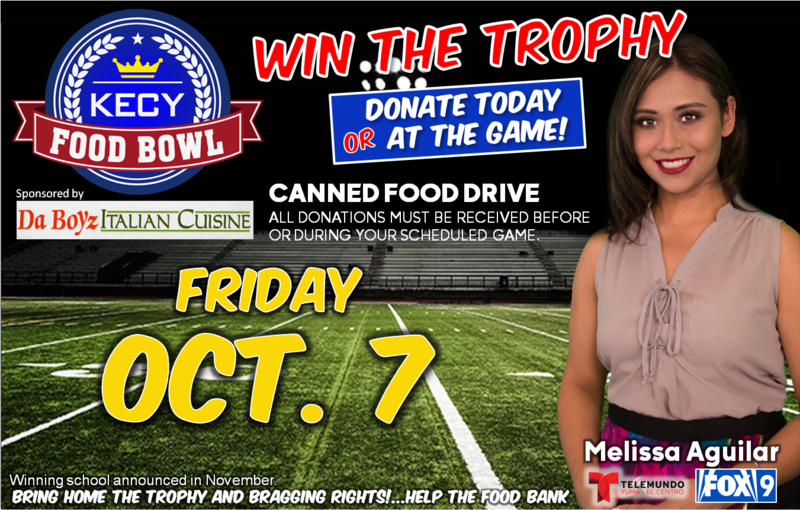 The school has a chance to support the Food Bank and bring home the braggin rights trophy! We will need your help to accomplish this feat! Bring cans to the school office any time between now and October 7th. The office is open Monday thru Thursday 8:30 to 4pm and Friday 8:30 to 1pm. If you can't get them to the office join us at the game October 7th and bring the cans with you!